Blandford Food Bank was set up to help those going through a crisis; providing them with emergency food parcels, sources of support and a warm welcome. The project has developed to become Blandford Food Bank+ - more than just a Food Bank. Providing food parcels, debt advice and support during school holidays through the holiday voucher scheme. It is a sad reality that currently in the UK many families and individuals do not have enough money to buy essential food items. Having to choose between paying essential bills or eating, people's lives can be turned upside down overnight. Redundancy, sickness, financial difficulties and low incomes are just some of the struggles people face in our community. Locally in Blandford there are families and individuals in this situation right now. Blandford Food Bank+ saw a significant increase in referrals last year - half of these were for those aged 25 - 39 years old. 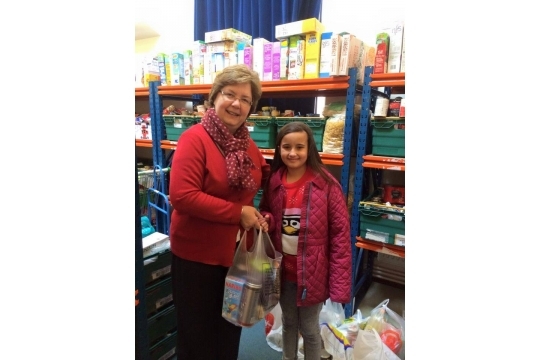 Blandford Food Bank+ gave out 344 food parcels, feeding 493 adults and 419 children. 68 families were fed during school holidays and support was provided to deal with £121,000 worth of debt. It isn't a privilege to have food, everyone has this basic need - thank you for you support in working towards ending food poverty in Blandford.